Over the next week or so we’ll be talking a lot about recommendations on LibraryThing and LibraryThing for Libraries. We’ve been doing a lot of work on this part of the site, and will be rolling out a number of improvements. Today we’re debuting a new system for showing recommendations on works. And come talk about it on Talk. Details. The first change is to the “brief” display on work pages. We have a new way of showing a “shelf,” with both cover and title. We think this is more appealing—to more users—than the previous text-only system. You can expand to “see more,” to get two more rows, then “see all” to get ten or more. The deeper you go the less confident we are that the recommendation is a good one. But our recommendations are often quite good deep. Besides “covers” and “text” you can also choose to vote on recommendations, as before. The new way of seeing recommendations has transformed the “All recommendations” subpage. (Here’s the ugly, list-y thing it looked like before.) To the various recommendation types we’ve added “More by this author,” which sorts the authors books by their algorithmic similarity to the book in quesiton, and “‘Old’ Combined Recommendations” for members seeking to compare the old algorithms with the new. As before, this page shows all the different elements that make up LibraryThing’s “main” (or “combined”) recommendations. A note on authors and repetition. Algorithmic recommendations are something between a science and an art. There’s a lot of math involved, some of it very complex indeed. But the mathematically “right” answer isn’t much good if it’s boring. So, mathematically, one James Patterson book is statistically most similar to two dozen other James Patterson books before and other author can contribute a book. But who wants to see row after row of that? Turning math into something stimulating and diverse, yet credible, is complex process. In this case, the same-author problem is addressed not in the initial data, but “at display,” by limiting how many times an author may appear on a given line. You can see this, for example, in the recommendations for The Fault in Our Stars, which restrains John Green from taking over, or Horns, which restrains Joe Hill, but also Steven King, Justin Cronin and others. Because of differences in screen size, members will now sometimes be presented with slightly different recommendations lists, as books get pushed between rows. We think the drawbacks there are outweighed by the visual benefits of not overloading members wih repetitive recommendations. Before and after, band-aid to chocolate. You may have noticed a few changes around the site … last week we pushed live the first major redesign of the LibraryThing site in… ever! (1) The final concept and design were something of a group effort, but the vast majority of the work was done by Christopher Holland (conceptdawg). Note that the new design is separate from the new Home page, blogged about here. New colors. The top nav bar has turned chocolate brown with red highlights. Goodbye, band-aid/dead salmon color! You’ll see other new accent colors around the site as well. Smaller, “fixed” top nav. The top nav is 25% smaller than the old version. This means you see more content on each page without scrolling. Like many sites today, the top nav is now “fixed,” remaining at the top when you scroll down the page. This feature is disabled on mobile devices, which handle “scrolling” differently, and, by request, we’ve also made this optional. To turn it off, click this at the bottom of the page. Profile tab. We’ve removed the “Profile” tab. But you can still get to your profile with one click from anywhere on the site: just click your member name in the upper right corner! You can also get to your profile from the “subnav” on the home page. New comments indicator. You’ll see a small yellow box appear in the upper right corner of the site when you have a profile comment. It will now even tell you how many new comments you’ve received. We’ve begun the process of standardizing the entire site to make all of the hundreds of LT pages look nice with the new color scheme, etc. We’re not quite there yet. There’s lots of work left to do, mostly little things where the old design is still poking through. We’re hacking away at those now. Members who joined prior to the launch of the redesign can revert to the old design for the moment. This will not be available permanently (it’s simply too much work to try and maintain two different systems), but it’s there for now. We want your thoughts. What do you think? What do you particularly like, or dislike? Come tell us in the New design – Comments #3 Talk thread. Found a bug? Come report it in the New design – Bugs #2 thread. 1. For a few months LibraryThing’s color was an even more terrible greige. 2. Truth be told, 72?!? That’s over 3,800 calories! This blog post is the “coming-out” party of the new home page, introduced last week. After extensive discussion—over 1,000 messages—with many changes and improvements suggested and implemented, “home” is effectively done. What’s the point? The new page is designed as a simple but rich “home” for how you use LibraryThing. It is a “central place” that puts everything in front of you and keeps you up-to-date. But since members use LibraryThing in so many different ways—cataloging, keeping track of current reads, getting new recommendations, socializing, etc.—it had to be a menu of options, and extensively customizable. The new home page replaces the old, introduced five year ago, which had grown cluttered, long and slow. It was customizable, but limited and buggy, and many members skipped it. Pages and Modules. The new home page is divided into pages like “About you” and “Recommendations,” plus a main “Dashboard” area. The pages sport 47 modules—more than twice as many as before. Modules do things like list your most recent activity, recommend books, update you on what your friends are reading, and track your contributions to the site. Customize it. The home page was designed to start off useful, but many users will want to customize it. 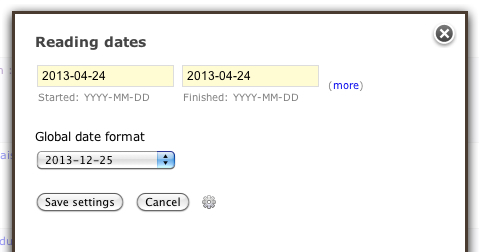 You can reorder the modules on every page. You can put the modules in one column or two, and set where the column break is. You can move modules on and off your dashboard, and other home pages. Every module can be customized, often extensively (see the example below). Most members will want to focus on their dashboard—adding, deleting and reorganizing the modules until they’ve got the perfect jumping-off page for the rest of their LibraryThing. Member Gallery. See pictures in your gallery and add new ones from the home page. Recent Member-uploaded Covers for Your Books. Keeps you up-to-date on the newest covers other members have uploaded for your books. Your Notepad. Create a handy list of shortcuts or notes. Your Library over Time. A cool chart showing how your LT library has grown. Lists. Modules for Your Lists, Active Lists, Recent Lists, Lists You Might Like bring LibraryThing’s Lists feature in the mainstream. Your Recent Reviews. Reminds you what you’ve reviewed recently. Reviews for Your Books. Find out what other members are saying about your books. LibraryThing Roulette. Click for a random book, author, series, etc. Weirdly addictive, and helpful for helpers. Helper modules. A page with statistics and links to venue linking, work combining and the dozens of other ways LibraryThing members help each other. Recent Haiku. See book summaries / by members cleverly put / in five-seven-five. Thingaversaries. Members have been celebrating the anniverary of their joining LibraryThing for years; the home-page module makes that easier. Tag watch is back! The much-missed Tag watch feature has returned, much simpler and easier to use. Recommendations now includes subsets. You can choose between top automatic recommendations, recent automatic recommendations, and recent member recommendations. Dates. Recently-added books and recent recommendations now include dates, so you can see when you added a new book or when a recommendation was made for you. 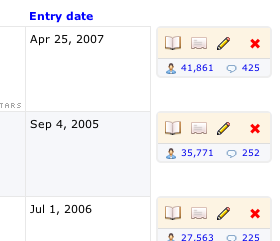 On This Day now factors in the popularity of the authors, so it gives you the most relevant author birth- and death-days. By default it also prefers to show authors you have. 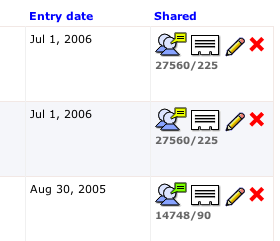 There’s also a new “On this day” Common Knowledge page. We redesigned the Featured Authors section (in the Books section under Discover), to show more LibraryThing authors. Background: We also recently released a new design—out with the “band aid” or “salmon” and in with the chocolate. Staff, especially Chris (ConceptDawg) is still working on that design, tweaking color choices and making sure it works right on all the browsers and devices out there. See the design blog post for more. The changes to the Home page are largely based on discussions in the Wide open: What to do with your home page? thread, and Tim (timspalding) had great fun coming up with the new layout and all the brand-new, nifty features that are part of this. What do you think? Come tell us in the New home – Comments #3 Talk thread. Find a bug? Report it in the New home – Bugs continued again thread. We’ve gone live with a number of aesthetic and functional changes to members’ catalog pages. Some examples, or see my catalog. Look better. 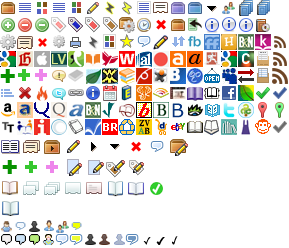 Those big clunky icons have been with us since the beginning—August 2005. The original files are on an old OS9 iMac. I’m sad to see them go, but man, they were clunky. LibraryThing is something of a “ransom note,” but we’re moving toward uniformity and beauty. You’ll see the little icons popping up elsewhere. Prepare the way for collections. Collections was too deeply integrated into the “new” catalog to bring it live separately. Doing both at the same time would have been a lot of work too. We’re getting closer*. Better “covers” display. Mike is working on that. We decided to go ahead without him. New Catalog #1: Larger issues. Larger reflections on what we did. For the sake of argument, assume that it’s “working” for you, and concentrate on whether you like how it works. New Catalog #2: Bugs and small issues. Small issues, particularly ones we can just fix. I want these sequestered, so we aren’t stuck with messages 2-20 in the main thread being about some trivial bug that got fixed. *At least you’re all now on the catalog we’ve been using for months, anyway. **As Chris says, “Tim has found a hammer.” It’s all CSS-sprite-shaped nails to me now.